XHTML is a family of XML-based markup languages. XHTML 1.0 (in 3 flavours): HTML 4 in XML. XHTML Basic: For small devices. We are currently working on a new member of the XHTML family, in our minds the real XHTML. In fact as I will show, many of these things are intertwined. By 'generic XML' we mean: if a facility exists in XML technologies, and it is suitable, use it and not a special-purpose XHTML facility. Try to get missing functionality added to XML. Major missing functionality: Linking (XLink insufficient for XHTML's needs). Advantages: less variability; more interoperability; much of XHTML 2 works already; opportunity to make a cleaner break. Use stylesheets to define presentation. Advantages: possible to author once, and display on different devices; better presentation possibilities; device presentation not hardwired; CSS has support for devices; more accessibility. Power of CSS currently seriously underappreciated. Add more semantically-oriented markup to make documents richer. What are the important properties of a website? All other reasons were 14% or lower. Client-side image maps give better usability by allowing feedback to the user about where is clickable, and where a click will lead to. But they also give more accessibility, by allowing accessible software to create an equivalent navigation control. As an example of poor usability, current frames are a disaster! Search engines find HTML pages, not Framed pages, so search results usually give you pages without the navigation context that they were intended to be in. Currently devising XFrames, a replacement for Frames. One day we will all be grateful for accessible websites. Maybe even today. As an example of a current problem: <h1>, <h2> etc are mostly terrible for accessibility, because no one uses them right, and it is hard to work out document structure from so little information. More structure gives more accessibility. Less use of text-in-attributes (like alt), that cannot be marked up. Observe how scripting is currently used. Examples: menus for navigation; forms data checking; folding presentation. Scripting language is hard-wired in document. Essentially defines two separate parts: the 'real' form (data, datatypes and submission details), and form controls bound to the data. XForms 'native' form controls are device-independent, and accessible, though a language may define its own. A user agent has a default presentation. If the user agent supports it, a stylesheet can be used to define other presentations. This example covers both radio-button style selection, and menu selection: not encoded in the control. Is a good design enough? But can we achieve this just through good design? Well, we've got a friend. "Google is, for all intents, a blind user. A billionaire blind user with tens of millions of friends, all of whom hang on his every word. I suspect Google will have a stronger impact than [laws] in building accessible websites." "In a world where Google likely has a valuation several orders of magnitude higher than any chrome such as flash, graphics, audio, interactivity, or "personalization", I see a heady revision." Changeable sites. The longer you stay in one place, the better your Google score. Don't move content! Don't change your URLs! Text-as-graphics. Google handles a number of formats, but it doesn't OCR. In other words: avoid things that are bad for accessibility! HTML was originally designed as a structure description language, not a presentational language. 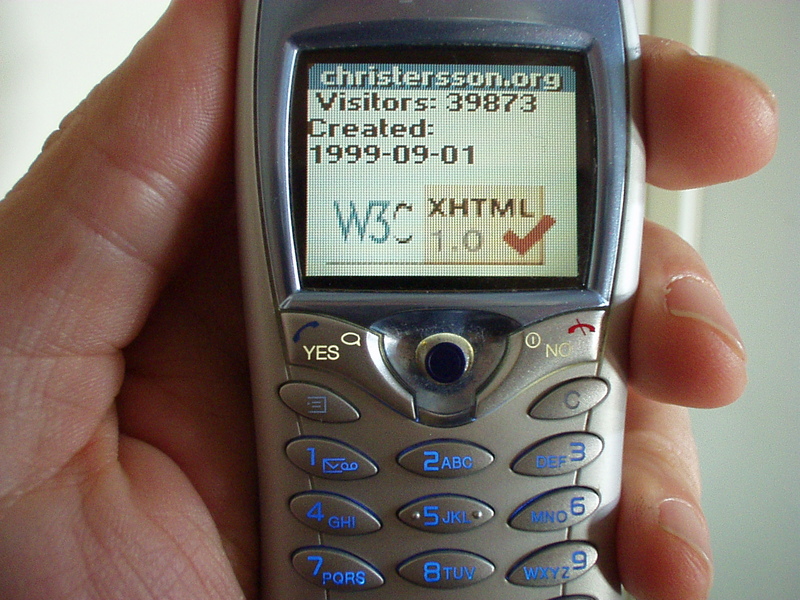 The design of XHTML is truly 'radical': taking HTML back to its roots. Device independence, accessibility and usability are surprisingly closely related. Even though website builders may not yet know it, device independence, accessibility and usability have a major economic argument in their favour. Spread the word!